Reinier van Noort started modern (foil) fencing in 2003, but after being introduced to Medieval European Martial Arts in the summer of 2005 his life was changed forever. 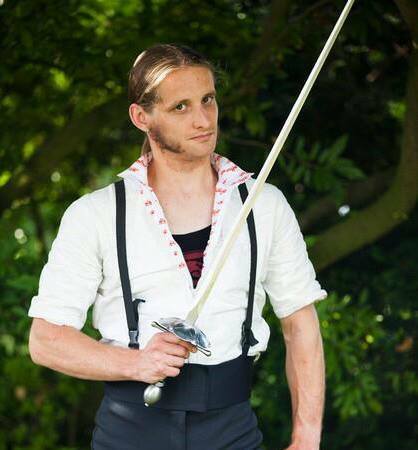 From 2005 until 2010, Reinier trained in longsword and other medieval martial arts with groups in the Netherlands, and since 2007 he has been increasingly active as a trainer. From 2008 until 2011 Reinier has also trained Kadochnikov Systema. Through making the first English translation of Bruchius’ “Scherm- ofte Wapen-konste” (Fencing- or Weapon-Art”) in October 2009, Reinier developed a keen interest in rapier fencing, and since January 2010 he has been researching, training and teaching the Art of Fencing described by Johannes Georgius Bruchius, as well as studying related treatises and other 17th century self-defense arts. In 2011, Reinier won the “best fighting technique” award in the HEMAC Dijon Rapier tournament. Reinier also received a 2014 HEMA Scholar Award for Best Researcher.